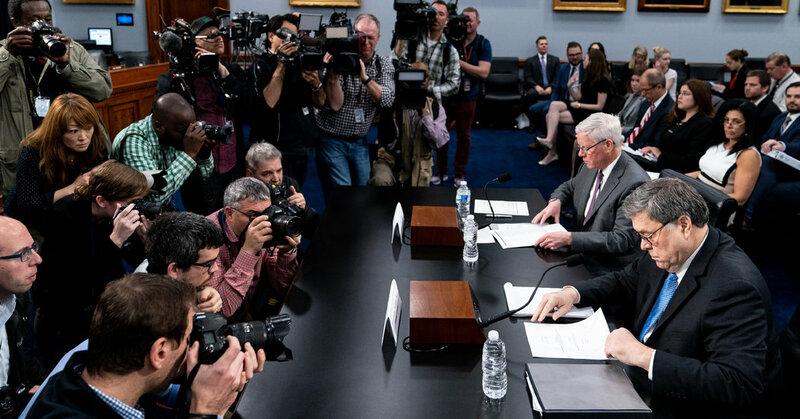 • Attorney General William P. Barr will go before Congress for a second straight day on Wednesday, giving lawmakers another shot to grill him about his handling of the special counsel’s report. • Mr. Barr said on Tuesday that he would release a redacted version of the report “within a week” as he continued to work on blacking out delicate information. • Meanwhile, the Senate Judiciary Committee is taking up the confirmation hearing of Jeffrey A. Rosen, President Trump’s nominee to succeed Rod J. Rosenstein, who appointed and oversaw the special counsel, as deputy attorney general. Barr will try to reveal little about the Mueller report. In his testimony on Tuesday before the House Appropriations Committee, Mr. Barr divulged several new details about the report from the special counsel, Robert S. Mueller III. He said, for example, that he was still on track to give Congress and the public a partly blacked-out version of Mr. Mueller’s report “within a week.” Where he does censor lines, he said he would identify which of several categories of information he has said cannot be divulged to Congress — like information that is subject to grand-jury secrecy rules or identifies a “peripheral” person. And he said that Mr. Mueller had not helped draft or reviewed his letters to Congress summarizing the conclusions of Mr. Mueller’s report. But beyond those tidbits, Mr. Barr refused to engage House members who were pressing him to say more, declaring that he had said all he intended to say. Democrats will push for more. House Democrats, however, occasionally succeeded on Tuesday in getting Mr. Barr to reveal or hint at something more. For example, even though Justice Department officials had previously said the White House has not been shown the Mueller report, Mr. Barr proved unwilling to confirm that — raising the possibility that since then, the Justice Department may have briefed Mr. Trump’s inner circle about its contents. He also indicated that he was not willing to petition a judge for a court order permitting him to show grand-jury information to the House Judiciary Committee. Senate Democrats will be looking for further opportunities not only to scold Mr. Barr for failing to show Congress the entire report, but also to extract additional facts and insights beyond what he had been planning to say. Rosen will try to stay above the fray. The position of deputy attorney general has received outsize attention during the Trump era because former Attorney General Jeff Sessions recused himself from overseeing matters arising from the 2016 presidential election, citing his role as a key Trump campaign supporter. That left the departing No. 2 at the department, Mr. Rosenstein, to serve as the acting attorney general for what became the Mueller investigation. Because Mr. Barr has not recused himself, Mr. Rosen is unlikely to be as powerful and scrutinized as Mr. Rosenstein has been. Still, Mr. Rosen’s confirmation hearing is notable in part because of Mr. Rosenstein’s demonstration of how the position can suddenly be thrust into the spotlight. Mr. Rosen spent most of his career as a lawyer in private practice, though he is currently the deputy secretary of transportation and previously served as the top lawyer at the White House Office of Management and Budget in the final years of the George W. Bush administration. He has never been a prosecutor, but in a planned opening statement the administration released Tuesday, he vowed to uphold the rule of law. “I believe I can make a meaningful contribution to an institution that I regard as a cornerstone of our American system of government and consider it both a duty and an honor to serve our country,” the statement said.